Geoffrey is the orphaned prince of Kaveg. He has chosen to follow a quest to find the fabled "queen with his own heart" who will heal his land. Nanda is an American stage combat choreographer just searching for a reason to live. They find each other, and they lose each other. Together, can they both find what they're looking for? What did you love best about Geoffrey's Queen? It took me a few chapters to understand that the journals were going back and forth (from America to Kaveg. Once I understood, the action was captivating. I love the details given for the fighting and practice martial art forms. Very clear to visualize. Kaveg was easy to create in my mind thanks to the author's great writing skills. Which character – as performed by Gwendolyn Druyor – was your favorite? Nanda was my favorite character. Annie the dragon was fun. I just love audiobooks where the author reads their own work. The inflection is perfect because it is read the way it is intended. I really wanted to keep listening to this story. I know I look funny standing still in my front yard...just gazing at nothing while listening to a very good scene. I am going to purchase Hardt’s Tale. I really want to know what happened before Geoffrey and Nanda. I want to know more about the blood price and Mobious. If you are looking for an easy laid back read that you can multitask listening to it, this is not the book for you. I decided to get the kindle version to go along with this audiobook. I was having a hard time keeping up with this twisted tale at first but once I gave my full attention to it, things started making a little bit more sense. Each chapter starts with diary entries from one of the two main characters Nanda and Geoffrey. Geoffrey shows up in modern day Chicago/Colorado with memories from his time spent with Nanda in Kaveg, but she does not know him. Nanda time travels to the kingdom called Kaveg where she finds Geoffery but he does not know her then! Although Nada has memories of their time in modern day America together. It is a well woven tale that needs our full attention. It was quite frustrating at times trying to understand what was going on and I'm not too happy with Mobious. He has some serious explaining to do. I was not ready for the book to end when it did. I was actually quite shocked with how things ended up. I'm looking forward to the next book so everything can be straighten out. The narration was done to perfection! It is an amazing story with adventure, drama and romance. I received this audiobook from the Author in exchange for my unbiased opinion. Complex and compelling story of love trying to find its way back together. Geoffrey is on a quest to find his Queen, Nanda a stage combat choreographer is just trying to survive. Together they travel thru dimensions and both tell there stories as they travel together and separately. Thank you Gwendolyn Druyor for gifting me this audible book for a fair and honest review. It was an interesting fantasy, and well told by you as it’s narrator. What did you like best about Geoffrey's Queen? What did you like least? I liked the Ending. I did not like the Timeline of events. What aspect of Gwendolyn Druyor’s performance would you have changed? Nothing. The narration was wonderful. Did Geoffrey's Queen inspire you to do anything? I found the book difficult to follow due to the timeline of the book. It all made sense in the end but I was very lost until I figured out that the two timelines must have been happening simultaneously. Geoffrey's Queen: A Mobious' Quest starts with Nanda's being displaced into the land of Kaveg from modern-day Chicago and Colorado. Here she meets Geoffrey, who is on a quest to find a certain woman to be his queen. The story travels between Kaveg and Chicago and Colorado with time and inter-dimensional travels. Both characters tell their tales from their point of view. Readers/Listeners will have to read/listen to the story closely. There are twists in both Nanda and Geoffrey's stories. Nanda travels to Kaveg where Geoffrey doesn't know her and Geoffrey travels to Chicago and Colorado where Nanda doesn't know him. There is even a moment where Geoffrey thinks there are two Nandas existing in both worlds. 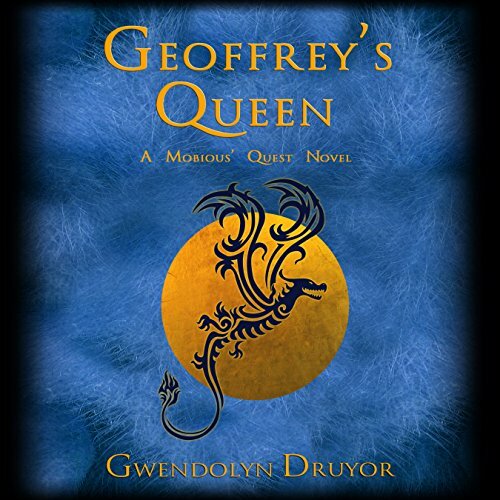 At the end of the story, there is a big revelation of discovering who Geoffrey's Queen is. I do love this twist in the story. The story is very complex but is worth reading and listening to. Readers/Listeners will come away from this story with an AHHHH. And this story has dragons and a villain who wants Geoffrey's throne in the complexity of how this story is written and told. I was given this audiobook by author via Audiobook Blast in exchange for an honest review. I was not compensated or influenced in any way for writing this review. Oh, that was fun. That was so very much fun. I confess my initial expectation for a book narrated by its author was … low. But the sample sounded good; everything sounded good. And lo: it is good. It's told unconventionally, with the journals of the two main characters (Geoffrey and Nanda) alternating to relate their time travel (sort of), travel between worlds – oh, and comparatively conventional travel across a fantasy landscape where most things are familiar, though quite a bit isn't (blue blood …. ?). At one point, Nanda uses as a simile that jarring sensation when you misjudge a staircase and expect one more step than there actually is. That's also a valid metaphor for parts of this book. When suddenly a new name pops up, mentioned in a context that means they've been around for a while; or when an established character is mentioned in a context that makes no sense in relation to what has gone before; or when "past" events are mentioned before the story has been told (Wait, all of that happened FIRST?) … it's a bit like having the ground shift under your feet. Or taking that extra step where none exists. The timelines and storylines form a rather appropriately Celtic knot. I never have been able to juggle in real life, but I can usually keep all the balls an author throws at me up in the air… But Gwendolyn Druyor threw a bowling pin, a flaming torch, and a live fish in there, and there were times when I stopped short and said (out loud and everything), "Wait, what?" And "Who, now?" And then there was a slightly strangled "Wait, that happened first??" followed by a rapid reshuffling of the mental cards. I enjoyed the style of Geoffrey's people's government. (I haven't gotten the digital edition yet, and I'm not going to try to spell the country's name.) I never thought about government reparations in this way before: we didn't prevent this from happening, we didn’t protect you, therefore have some money - or, here, perhaps some other form of compensation. I loved the worldbuilding: this is a deep, rich, well thought out setting. The characters are nicely well-rounded, and don't always do what you expect them to. And did I mention the dragons? Just when you thought you'd seen every possible variation of "large winged beastie which breathes fire", you haven't. Oh, and about that author narration? Lovely. The author is an actress, and in fact has extensive experience narrating audiobooks. And after all – who is going to give just the right delivery of a line if not the person who wrote it? Highly recommended – and my thanks to Ms. Druyor for the book! Because "This audiobook was provided by the author, narrator, or publisher at no cost in exchange for an unbiased review courtesy of AudiobookBlast." I LOVE THE FACT THAT THE AUTHOR NARRATED HER OWN BOOK!! SUCH AN EPIC TREAT!! NOT ONLY DID SHE DO AN AMAZING JOB NARRATING BUT THE BOOK ITSELF WAS AMAZING AS WELL!! I HOPE TO DEFINITELY FIND MORE FROM GWENDOLYN DRUYOR!! THIS IS DEFINITELY A 5 ☆☆☆☆☆ BOOK IN MY OPINION!! MOST DEFINITELY WORTH A CREDIT!! Unique story, narrated to perfection! I must admit this book was hard for me to get into. I was so confused the way the story started, and after a couple of tries, it still didn't make any sense to me. I felt like there must have been another book prior to this one, so I went hunting through the author's website and found Hardt's Tale: A Mobious' Quest novel. At first, I thought I found the missing book and, in a way I did. Hart's Tale is a must read if you want to have a better understanding of the world Geoffrey's Queen takes place in. It's a quirky, but charming fantasy story that happens about 40 or so years before Geoffrey's Queen takes place. In the long run, it did help, but not until later on in the book. I finally decided to bite the bullet and make myself start the book over again and stick with the story this time. I'm so glad I did. What you need to know is that the story is told in first person, as it's written by each character, in their journals. Each is telling the story of meeting each other for the first time (at different times), while the other remembers their past together. It's a "chicken or the egg" kind of premise. You just have to let go of any expectations and go with the flow. Once done, you will find yourself reading a non stop adventure and a touching love story that will not disappoint. Also, Gwendolyn Druyor narrates her story perfectly, I really liked listening to her voice. He could not have picked a better queen. In the beginning it was a little bit difficult keeping track of all the switching back and forth. By the end it all fell into place. Narration was done very well. Enjoyable to listen too.